Navigation menus colour configuration: site managers can now configure a lot more colours of the site. For example the background and text colour of the header navigation menu and the secondary navigation menu that is used for user profiles, groups, and events. Colour configuration preview: site managers can now preview how the site will look while configuring site colours. This makes it much easier for site managers to give their site the perfect look and feel. 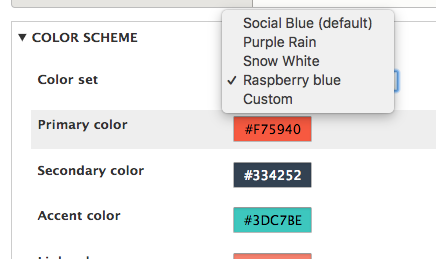 Preset colour schemes: having hard time getting colour configuration right? Site managers can now choose from a few preset colour schemes which makes setting up a new site much quicker. After a topic or event is created, the author, the organisers, and community managers can move the content to a group, out of a group, or to another group. This saves users the trouble of creating content again if it was put in the wrong group during creation. It is now also possible to specify a relevant group when creating a topic or event. This way, users don’t have to find a group first before creating content. Users can now add a banner image to their own profile. This provides users with more possibilities to express themselves with original images/content. Joining group events became easier: Previously, users had to first join groups in order to attend the events belonging to that group. Now, site managers can allow users to join events directly regardless of their group membership. The user also automatically becomes a group member this way. Rename ‘Topic’: Now site managers can rename ‘Topic’ into something that suits their needs, such as projects, ideas, articles, etc. This way, the use of ‘Topics’ is more flexible. Note: there are a few places that the renaming is not shown, this will be fixed in the next release. E.g. in urls ‘ all-topics’ and in the notification center ‘ someone commented on a topic’. Group notifications: users will now start to receive notifications of the activities of the groups they have joined. This will make users more engaged in their groups and prevent users from misusing the mention function. Hero areas are removed from editing and setting pages: A hero area is the large area at the top of a profile, group, topic, or event page. Previously, it was also shown on editing and setting pages. Now they are removed to make these pages simpler and clearer. New icon for embedding media: a new embed media icon has been designed and implemented in the description fields to make this function clearer for its users. Please check it out! Disable regular login when Single Sign-on is enabled: site managers can now disable the regular user login when Single Sign-on is enabled. This gives site managers more control over how users can login to the platform. Better term for moving a member out of a group: instead of naming this function ‘delete member’, it is now named as ‘remove member’ in order to communicate this function more accurately. Disable the comment attachment feature: It was not possible to disable the comment attachment feature. This issue is now fixed. Image upload requirements text is back: The text that explains the image upload requirements is back in the new release. Link to comments go to the right position: When users arrived at a comment from a link, the top part of the comment was covered by the header navigation menu. This bug is fixed. Improved sitemanager personal settings page: previously for site managers, their personal settings page does not follow the look and feel of the platform. This is corrected in this release. Do you like our new updates? Request a trial! Enjoy Open Social.